When it comes to stress, we like to relieve it. It’s an efficient way to work on your anxiety levels and to relax your mind and body. You can choose from many massage types. Maybe the best way to find out what suits you the best is to experiment and to do research. As one of the most beneficial stress relief options, massages provide your body with enjoyment and improved energy flow. To relive negative energy, it’s crucial to pick a massage that will meet your needs. Some people prefer deep-pressure massages, while others go with the light ones. 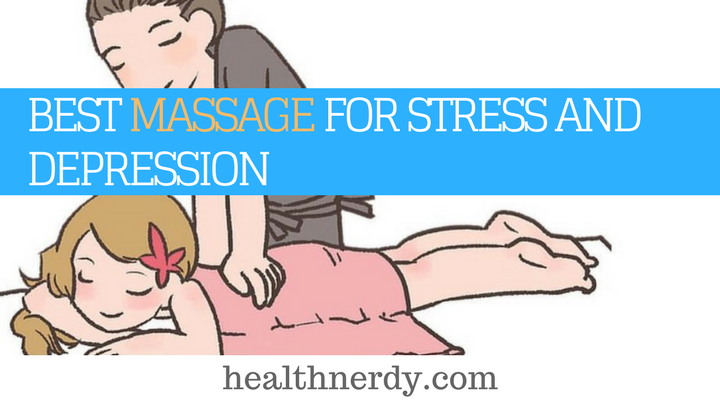 Can Massage Help With Stress? Can Massage Therapy Help With Depression? What Pressure Points Relieve Stress? How Often Should You Get a Massage For Anxiety? A type of therapy that involves massages is advantageous in alleviating pain, enhancing mood and fighting anxiety attacks. It is shown in the study published by the Group Health Research Institute, Seattle, Washington. Your selected masseuse will find a treatment that works for you. That way, he/she will manipulate your muscles and tissues to relieve stress. After a massage session, you will feel rejuvenated, and you will be in a better mood. In addition to that, your cortisol levels (stress hormone) will decrease. Hence, you will be able to feel how your sleep quality is improving and you’ll feel more energized. One important fact for women is that a massage can improve your body image. Thus, it contributes to your self-confidence and psychological health. If you have doubts about what is the best type of massage to get, you need to know that every massage is different and offers a wide range of benefits. There are different kinds of pressure, techniques, and methods, and what you’ll choose depends on you and your preferences. Your initial goal should be relaxation and healing. That way, you will get your energy and balance back. Swedish Massage – This type of massage is widespread, and it involves some basic movements. In the beginning, your therapist will use long strokes. Next comes muscle rolling and kneading. Afterward, you will feel deep pressure on the specific spot that bothers you. It’s beneficial for cramps and stress relief and relaxation. Hot Stone Massage –Your masseuse, will use stones to weight down your body and to massage it. The heat of stones will help you to achieve the feeling of released tension. It will maintain your focus on the moment, and it won’t let you drift off. You’ll feel relaxed and revitalized. Chair Massage – This approach is usually used for a neck, back or shoulders massage. You have to sit with your face forwarded in a massage chair. What’s great about it is that it doesn’t require massage oil or taking off your clothes. However, you won’t get a full-body massage. Nevertheless, it can effectively relieve the tension in your upper body and provide you with stress relief. It’s quick and beneficial. Deep Tissue Massage – When your therapist locates the spot that creates pain, he/she will apply deep pressure at that particular Your knotted muscles will be pushed hard to heal them. However, most of us have trigger points in our muscles that are sensitive. Therefore, it’s essential that you communicate with your therapist so that he/she can correct the pressure. Shiatsu Massage – It’s one of the ancient healing methods that come from Japan. The name of this massage means ’finger pressure,’ since it consists of work with fingers, along with palms and elbows. A shiatsu massage will improve your energy flow and balance in your body. It involves stretching on the floor. Benefits range from enhancing internal balance to relieving discomfort, pain, and stress. Thai Massage – It’s a favorable method to invigorate your entire body. It’s done by manipulating your muscles and doing yoga poses. Your therapist will use your whole body (knees, feet, legs, and hands) to lose your joints and muscles. Thai massage is both relaxing and energizing. It will contribute to better energy and enhanced flexibility. You can also try to combine essential oils with candles to achieve more benefits and reduce stress. Some of the scents that you can experiment with are clary sage, lemon balm, rose, lavender, and peppermint. If you don’t have time or money to go and visit professionals, there are plenty of ways to practice self-massage for anxiety relief. Also, you can try touch therapy. It’s a gentle approach that is non-invasive and provides relaxation. It involves light touch, and it’s based on energy. Massages could help with fighting one of the most common outcomes of everyday stress – depression. Different methods of therapeutic massage have been used for centuries to reduce depression. Nonetheless, massages can decrease cortisol levels by 50%. At the same time, they yield increased levels of dopamine and serotonin, which are responsible for the stability of your mood. To combat depression, even more, you can introduce exercise into your daily routine. A massage will come in handy if you need to relieve soreness and muscle stiffness. Three Mile Point – This specific spot that is placed two fingers below your knee cap and four fingers towards your outside area of the leg can be beneficial for fighting fatigue. If you apply pressure on it, you will improve your energy flow and concentration. Hold pressure for about 1 minute. Grandfather-Grandson – It’s located three fingers behind your big toe on the inside. If you apply pressure on it, you will balance your energy and relieve stress. Also, it can alleviate ankle pain. Great Rushing – This spot found in the middle of your big and second toe. By applying pressure to it, you will enhance your energy flow and unblock the meridians that are choked. Outer Gate – This specific spot lies on the back of your arm, 3fingers above the wrist. Applied pressure on this area will improve the function of your immune system and increase energy. Inner Gate – This point is placed on your palm, in the middle of your index and middle finger, three fingers above the wrist. If you stimulate this spot, you can prevent heart stress and alleviate nausea. Will’s Chamber – It’s located on your waist, on its midsection, 3fingers from the spine. By applying pressure on this point, you will relieve tension in your back and enhance energy flow throughout your meridians. Shoulder Well – This point can be found between shoulders and neck. By stimulating this point, you’ll feel an instant stress relief and increased energy flow. The answer to this question depends on your time, money and requirements. Usually, it’s beneficial to get a massage twice a month. That way, you will prevent anxiety from occurring, achieve overall good health and improved mood. The study published by the Group Health Research Institute, Seattle, Washington shows the effectiveness of a massage for anxiety disorder. If you need pain relief, then you will probably need to get a massage more frequently. Two massages per week for about a month should alleviate your symptoms and solve your problems. You should also incorporate regular massages if you’re an athlete. It’s an advantageous way to preserve your muscles, improve performance and flexibility. Some of the best places to get a massage is isolated and quiet rooms. That way, you won’t get distracted, and you’ll be able to relax and enjoy your session. Massages have become popular due to their health benefits over the last years. They are helpful when it comes to increasing the function of your immune system and relieving pain or stress. A professional therapist can target the painful area, and that way provides you with pain relief. If you need additional information about its benefits, you can look at the study published by the Division of General Internal Medicine, Mayo Clinic, Rochester. Also, a massage can elevate your blood flow, along with your mood. Breathing will be more natural, and your heart rate will be lower. In addition to that, it offers better and more quality sleep.